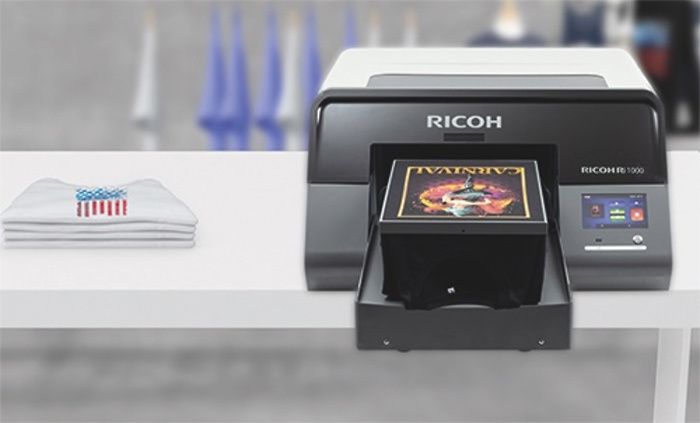 Two new Ricoh printers are rolling out into the market in the upcoming months. The new is designed for entry- and mid-level operations and will use its new sign and graphics inks. While pricing is not reveiled yet, Ricoh said it would be benchmarked against all flatbed devices with 2.5×1.3m table sizes. Ever dreamed of making a custom T-shirt with a cool slogan or fresh meme on it at the snap of a finger? You can do so pretty soon with Ricoh Ri 100 coming to the US in the Spring. Printing on fabric is technically challenging — as with 3D printing it requires special consumables, faces some constraints when it comes to the designs you can print and can reach high temperatures. So direct-to-garment (DTG) printing hasn’t been consumer-friendly when it comes to prices. Until now. 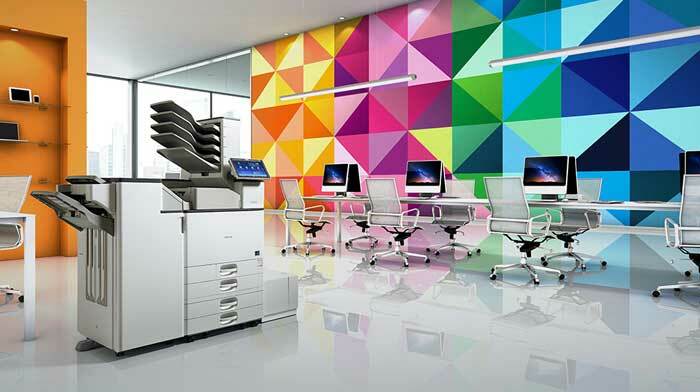 Earlier this month, Ricoh USA, Inc. has unveiled 2 new printers for medium sized offices. The models are very compact and provide additional finishing options which allows companies to produce high quality output in-place saving money and time with no need to outsourse such jobs. 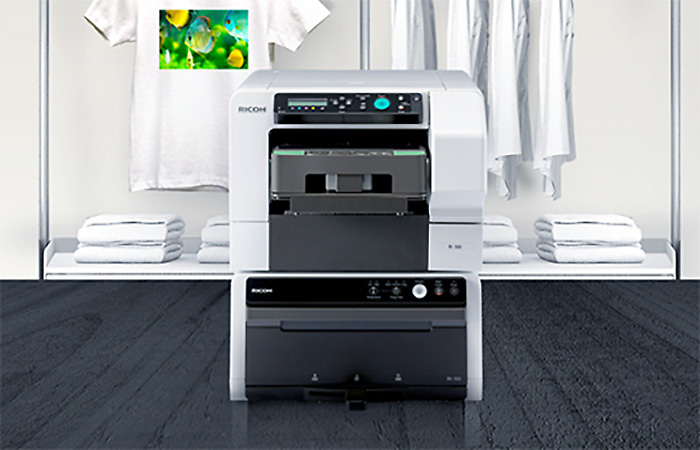 Ricoh Americas Corporation has announced 3 new monochrome machines with mobile and environmentally friendly features. The company’s goal is to improve the connection between people and information, providing high quality and sustainability products, solutions and services. Wi-Fi Protected Setup (WPS) and All-In-One print cartridge technology in all the novelties enhance information mobility and simplicity of use. Earlier this summer Ricoh announced a new line of color MFPs with a range of advanced features. 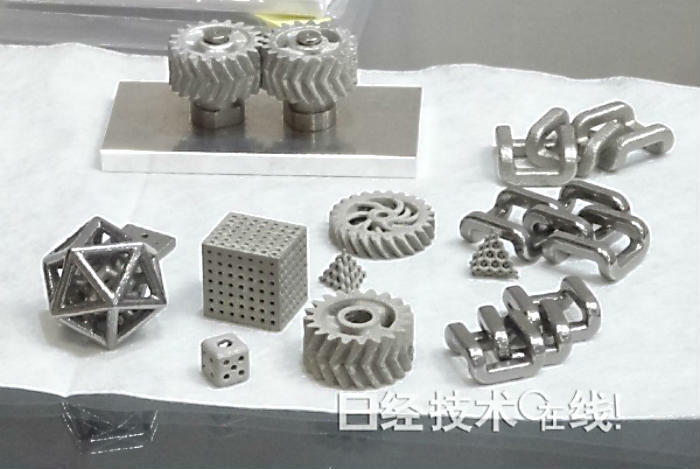 It will replace the previous models in the segment of primary systems for the offices with intense workflows. Some of the features really improve the work of the machines and could significantly boost productivity and raise the business on a new level. shortens the waiting time. In addition to the high printing speed of 30/35/45/55/60 ppm, the printers have rather short warm-up time: less than 20 seconds. The first page comes in 4.6 seconds in B/W and in 7.3 in color. Automatic Document Feeder allows images to be scanned much faster – at the speed of 80 images per minute. For those, who do much scanning, Single Pass Document Feeder (SPDF) is recommended for even more swift working. New Ricoh machines require less space, comparing with the other-branded machines of this class. This is achieved with integration of duplex and finisher (and saves space in a small office), while external finishers are also available. Every model could be ordered with a new Smart Operation Panel instead of a standard one. The new panel features big sensor display to provide the navigation of a smartphone, based on the Android OS. This feature is declared by the producer as the significant one, which sets new line apart from the previous devices. New PxP toner helps to get printouts of highest quality similar to that of offset printing; it sharpens details, smoothes rendition and lowers image granularity. As an option, the SRA3-format (320?450 mm) is available, what is a big advantage for a design or graphic business. These printers deal with much thicker paper, which results in higher quality professional output. The standard paper tray for 4,700 sheets can hold different paper sizes, including envelopes. That’s already enough to make a decent MFP! But it is not all. Ricoh has provided such options as mobile printing (available from any smartphone, tablet or laptop), printing from SD-card via the integrated Smart Card Reader and an External Keyboard Bracket (which allows to connect a keyboard through USB). 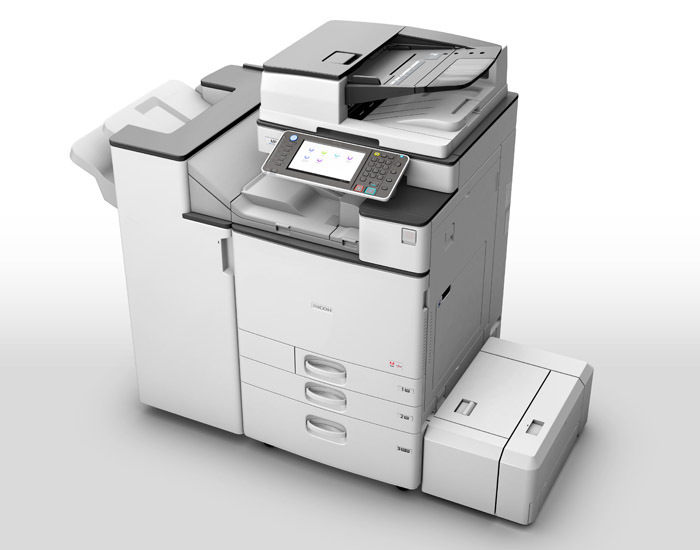 Add the lowest level of energy consumption in the class and the significant noise reduction, and you’ll get the picture of this new beautiful MFP. Ricoh Americas Corporation, the leading provider of digital office equipment, today announced the launch of the Aficio MP C2050/MP C2550 color multifunction products. 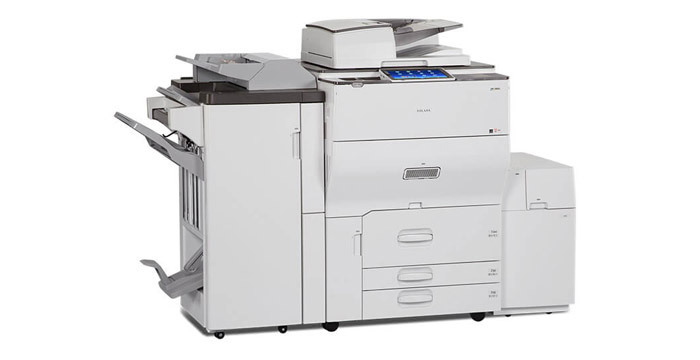 Designed for small- and medium-sized businesses, the MP C2050/MP C2550 Series provides the features typically reserved for more expensive MFPs at an affordable price. The Aficio MP C2050/MP C2550 delivers 20 pages-per-minute (ppm) and 25 ppm for full-color and black & white output respectively, and offers resolution of up to 1200 dpi. In addition, color documents look more professional with vibrant images due to Ricoh’s new PXP toner. Businesses can enhance productivity and reduce costs simultaneously with the Aficio MP C2050/MP C2550 Series as it saves paper by printing two-sided documents at nearly 100% of the simplex speed. store scanned documents directly to a USB memory device or SD memory card, for instant portability. The Aficio MP C2050/MP C2550 Series is equipped with an 8.5″ full-color W-VGA display for easy navigation. In addition, the Series supports a number of third party solutions, including GlobalScan NX and the Card Authentication Package, which enables users to efficiently and effortlessly complete tasks. The suggested retail price for the Aficio MP C2050 and MP C2550 is $5,800 and $7,500 respectively.